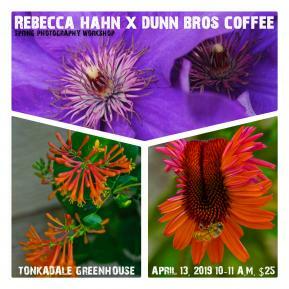 Bring your digital camera and come prepared for an entertaining hour of helpful tips, FUN, and delicious coffee compliments of our friends at Dunn Bros. (Excelsior). Rebecca Hahn is a photojournalist from this area with 35 years of experience in her field. She's hosted her own cable show, authored a book, and is often recognized for her sports column that she authored via the Sailor Newspapers. You will have time to cruise through the greenhouse and capture some images. There's still time to sign up with a friend, this will not be a technical program. Emphasis will be placed in "Artistic" creativity.